ON MONDAY OF LAST WEEK, I started a four-day look at the Occupy Wall Street movement that began in New York and has now found support in dozens of cities across the nation. To be sure, I thought it would make a good story, but more importantly I thought it was of unique and true value to America. You have to go back another generation – to mine – for an equivalent need that was met with dedication and power, specifically, to the student protests that arose in response to a general revulsion toward the kind of leadership that led to and continued the fruitless war in Vietnam. In those days I never carried a sign – short of gathering some posters that were made at college on the heels of the Cambodian invasion in 1970, and which I left in the garage. I can’t even say that I bought the premise, certainly not early on. In the 1960s I cast my vote for the Cowboy to be governor of California and claimed to be a conservative; but that changed for good after a walk across the UCLA campus, when I witnessed an anti-war rally, and the light came on. Still, you could say that I missed it in all practical terms. In like manner I missed it again, watching silently outside New York’s Plaza Hotel as demonstrators began a massive march through mid-town streets on the day before American troops embarked for Iraq. Now people were marching right into the heart of the most powerful financial district in the world and actually shouting what people all over the country were feeling and saying to their neighbors. And frankly, I wanted to at least see it for myself, talk to the marchers and activists and perhaps get a sense of what’s next. The protestors have set up camp in Zuccotti Park, a small one-block area near the southern end of Manhattan – and I was surprised just how small: Depending on your arm, you could almost heave a football from one end to the other. The park is sparsely covered by short trees, and slopes downward from one street on the east end to a bordering street on the west. As you stand in the very middle you’re looking up at high-rise builidings in every direction. And yet, there is an oasis feel throughout, likely from the trees, and a mild sense of isolation from the city around it. As a jumping off place, the organizers chose well. Zuccotti is one of some 50 privately owned parks in New York and is legally open 24/7, and it is easy walking – or marching – distance to and from the financial centers of interest. Members of the movement, which tended to vary somewhat from day to day, have set up small, plastic tents and use mats for sleeping on flat concrete. On the first day that I was there, the numbers were around 300 to 400 in the daytime and nearly tripled as evening approached. From corner to corner there was an unexpected quietness, not unlike a “business as usual” tone in late morning, joined by the buzz from the streets around the park as local businesses proceed. 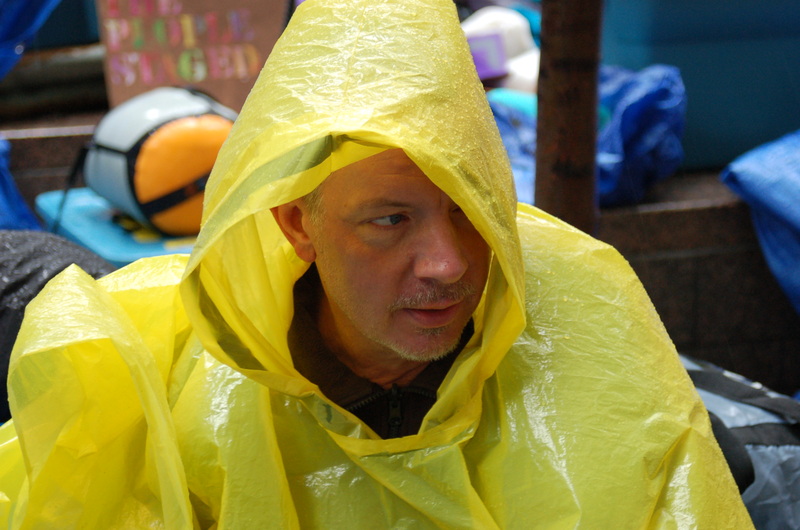 The small, plastic tents were set in random fashion, wherever, apparently, there was available space. By city ordinance, there are no gas stoves, no running water and no toilet facilities (that necessity, one man told me, is at least partially being met by a nearby 24-hour McDonald’s, whose patience is being sorely tried). On that note – Much has been said about hippie-type hygiene and cleanliness. At one point, the city threatened to evict the entire group, at least for a day, to “power clean” the premises. It never happened. On the Friday before I arrived in New York, the owners of the park themselves relented, based partly on pressure from local politicians (of all things!) and assurances from the OWS people who said the park would remain clean. Let me put it this way: Those of you who have known me for a long time can attest that I am a world-class neat-nik, and I can tell you that the promises have been kept with far greater fidelity than I have seen at church picnics. Fox news has and will find other things to complain about. On the south side of the park was a row of police cars, along with a very disturbing observation tower. And what, specifically, do the protesters do? Well, through the direction of a general assembly they plan actions to take in support of issues that they care about; this occurs in the evening where intent is expressed on the heels of individual discussions during the day. Activities for each day are written on a board at the center of the park. But keep in mind that the OWS movement lays claim to a lot of spontaneity; they are there together with a common drive and the larger actions occur in terms of timing and need. Currently on the agenda is a march on November 17. There have been incidents – none of which I saw – which can give meat to media, but my impression was one of thoughtfulness – and hardly surprising – little in the way of original philosophy or political impetus. Just a current application of seasoned dogma. I saw no Che Guevara t-shirts, no copies – or espousals of – The Communist Manifesto. Much of the discussion was of a desire for “governmental experimentation,” an obvious response or reply to the current failures or inaction of government to remedy high unemployment and a lagging economy. But of course, I wanted to talk to participants of this now well-known movement (be sure to check out “Doonesbury” this week). To get at least a sampling, first-hand. You’ve read much, from any number of persuasions, some finding the movement wrong-headed and threatening, some who are cautiously hopeful for the change they advocate, and most who don’t get it at all – if there’s anything to “get.” On the political front, no one has embraced OWS, perhaps because of it’s still fledgling nature, but many are ardently opposed, because like most populist movements it is not clearly understood and hence seen as a threat. Adash. Probably in his late 20s, lives in the New York area. Tucker. Early 20s, lives in the New York area. Marilyn. She’s 53 and lives in Toronto. Max. Mid-20s. Carpenter. Iraq and Afghanistan veteran. He lives on Long Island and comes to Zuccotti when he has the chance. Elsbeth. She’s 71 and lives in New York. And so it went. And why does it all matter? In a way – as I discovered – it does depend on who you talk to. But if there’s a consensus – if there needs to be a consensus – it’s the value of making an impact of some consequence. As always, the timing is important, along with who sees the issues your way, and then makes a point of taking action. It’s difficult to gain a following this way; there is fear, perhaps, of being on the wrong side. But when you think about it, those of a political stripe rarely bring their own views along, preferring to adopt those of others, with prominence being the key driver. That is, candidates sample issues and use those that have the best chance of getting them elected. A movement is different, in that the effort is aimed at gaining support and advocates for a common cause. With OWS the issue is simply expressing disgust and dismay with a financial system fine-tuned for the few, and the utter failure of government to fix and remedy it; in fact, with a maddening reluctance to do so. 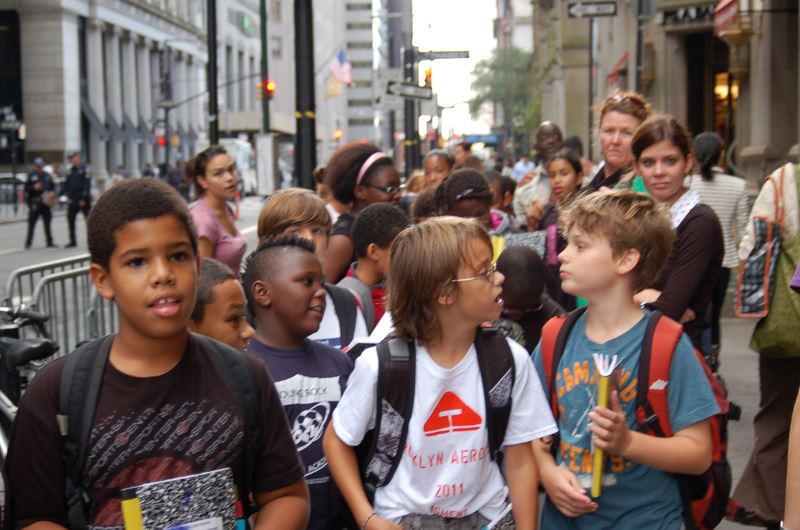 Kids from a local school on their way to Zuccotti Park, with notebooks in hand. As I was reminded there, revolution takes time and patience, especially on the part of the impatient, and it certainly requires a sense of inclusiveness. 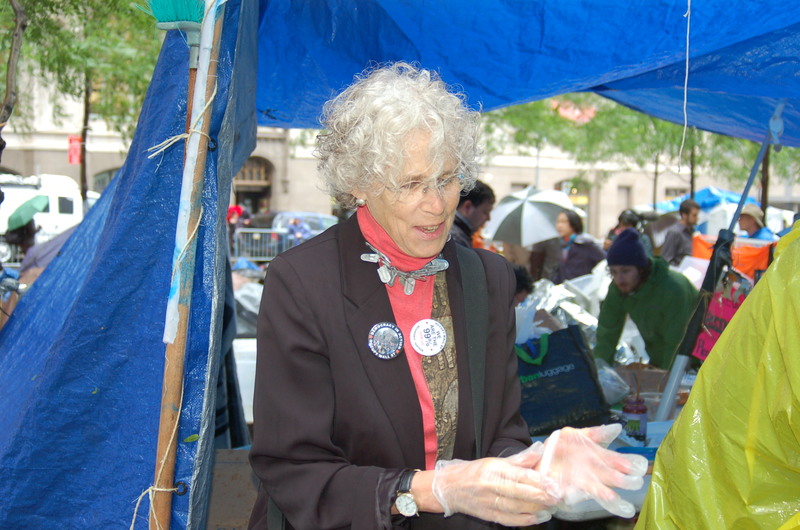 Whether you agree or disagree with OWS style or methodology – and what currently amounts to a certain chaotic approach – credit is due the people who believe strongly enough in justice and fair play to take to the streets and say so with a loud and persistent voice, and with an unmistakable call to action.